Hotel Lake Trasimeno - Italy holiday guide of hotel bed and breakfast residence farmhouse to stay in Lake Trasimeno. Lake Trasimeno, the fourth Italian lake for extension, is situated in Umbria in the center of a regional park, which was created to protect the beautiful environment. In the lake there are three islands: Maggiore, the only still inhabited, Minore and Polvese. The expanse of water is surrounded on three sides by evocative hills with ulivi and vine and on its shores there are characteristic villages, that make this place unique. The typical Umbrian-Tuscan landscape is rich of history, culture, traditions and it attracts many tourists, thanks also to the modern and pleasant hotel, farmhouse, bed and breakfast and holiday houses. Lake Trasimeno territory is very fascinating and it gives an unforgettable sight thanks to the intensity of the colors, the castles and towers of medieval age, churches and art, that offers several evidences of famous painters like Perugino. Its position just in the center of Italy allows to get easily some of the most famous art city centers in the world like Perugia, Assisi, Florence and Rome. 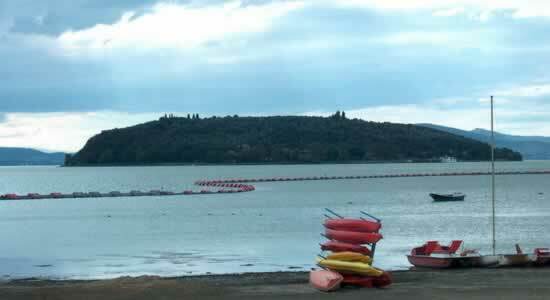 But Lake Trasimeno is above all an ideal destination to relax in nature. In fact the district is mainly a plain territory ideal for pleasant walks and mountain-bike trips also during autumn and winter. In the zone can be practiced also other sport activities, such as sailing, water skiing, golfing, tennis, horse riding and moreover, thanks to the fishing variety, the lake is a true paradise for fishermen. In this part of Italy there is typical food and wine product popular worldwide, that will render your stay very pleasant. The most famous localities in Lake Trasimeno are Castiglione del Lago, that is acknowledged one of the most beautiful villages in Italy, Passignano sul Trasimeno and Città della Pieve. Hotels with parking in Lake Trasimeno ? If you have decided to travel to Lake Trasimeno by car or motorbike, don't worry about finding a parking space or leaving your vehicle unattended. Display the list of hotels and accomodation in Lake Trasimeno provided with a parking place or a garage. Book a hotel in Lake Trasimeno with a parking area! Pet-friendly hotels in Lake Trasimeno ? Don't leave your dog at home. Use our guide to check the list of hotels and accomodation that welcome dogs in Lake Trasimeno. It is also possible, from our selected list of hotels and accomodation where animals are allowed in Lake Trasimeno, to keep your dog in the room with you! Hotel rooms for disabled guests ? Check our offers of hotels and accomodation in Lake Trasimeno with rooms equipped for the disabled! For your stay in Lake Trasimeno, book a hotel accessible to disabled people. Choose your hotel in Lake Trasimeno from the list of hotels equipped to welcome disabled people! Wi-Fi hotels in Lake Trasimeno ? Are you looking for a hotel or accomodation with a quick internet access and wi.fi? Click on the list of hotels in Lake Trasimeno which have a wireless connection to internet and wi.fi. Gay-friendly hotels in Lake Trasimeno ? Look for gay friendly hotels or gay friendly accomodation in Lake Trasimeno, choose to sleep in a gay friendly hotel or gay friendly accomodation in Lake Trasimeno! Take advantage of our offers of gay friendly hotels or gay friendly accomodation to book your holidays in Lake Trasimeno.